Having grown up in Trier, Mosel the Grand Duchy of Luxembourg is no stranger. As a teenager we used to drive to Luxembourg City to enjoy its night-life visiting the famous discotheque “Blow up” and thereby expose ourselves in a kind of pan-European experience, populating the dance floor amid dancers from Belgium, Holland, France, Germany and Luxembourg. 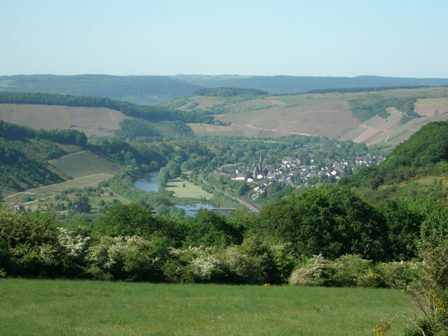 The above photo shows the Mosel valley, in the foreground the wine village of Nittel on the German side, and in the background the Luxembourg village of Machtum/Miechtem along the “Route du Vin”, the road which leads the visitor through the picturesque vineyards and wine villages of Luxembourg. I took these photos during my last visit to Trier at the end of June when I cruised along the river visiting both Grevenmacher and Nittel. One of the best kept secrets as regards European wines are the fine wines of Luxembourg. Total production is about 12.4 million litres of which more than half is exported (mostly to Belgium and Germany). The total area under vines is about 1300 ha only which is about a third of the Yarra Valley. Luxembourg is a kind of artisan wine producer, where the winery sector is dominated by small family-enterprises, whereas large, corporate-wine industrialists shine through their almost complete absence. Of the odd 430 grape producers only about 60 have their own wineries. Most vignerons are members of a wine co-operatives at the village level. Luxembourg is mainly a producer of dry, varietal white and sparkling wines (about 15% of total production). This is a stark contrast to the German side of the Mosel which has a strong tradition in semi-dry and sweet wine production. Of the 15 approved wine varieties, Müller-Thurgau (Rivaner) accounts for about 29% of the area under vines followed by the Burgundy varietals (together almost 40%). Auxerrois (14%), Pinot Blanc (12%) and Pinot Gris (13%). Riesling covers only about 13% of the area in Luxembourg whereas it is the dominant grape variety on the German side of the Mosel. Luxembourg also has about 10% of the area under Elbling, the oldest wine variety in middle Europe, characterized by its high acidity which makes it ideal for the production of sparkling wines. Chardonnay and Gewürztraminer are other white varieties grown. Pinot Noir (about 7% of the area) is the most common red variety of Luxembourg. Bernard Massard owns two vineyards along the Mosel: Domaine ‘Thill’ in Schengen (12 ha under vines) and Domaine ‘Clos des Rochers’ in Grevenmacher and Wormeldange (18 ha) with a combined production of about 120,000 bottles (or 10,000 cases) per year. Through the sparkling production in Trier about 3 million bottles of crémants and other sparling wines are sold. The French vineyards (Caves Monmousseau at Montrichard and La Petite Cave at Ronchamp) along the Loire river produce mainly crémants (Crémants de Loire and Touraine sparkling wines) and a variety of local wines. The bulk of Luxembourg’s family vineyards and wineries is much smaller than Bernard Massard. Because of the long tradition of viticulture in the villages and hamlets along the Mosel, many vintners come from families who have a strong family tradition in grape growing and wine making. Many families are related through intermarriage and therefore many wineries have combined family names most of which you will have never heard of. Representing these strong traditions I would like to mention only three smaller wineries. I apologise to all the others; I know many of you deserve a full portrait. The vineyards are located in Wellenstein, Remich, Wintringen and Bech-Kleinmacher. Main variety is Müller- Thurgau, however the most important varieties are Riesling, Pinot Gris, Pinot Blanc and Auxerrois. The Riesling wines of the Gottesgôf selection are worth trying, and so is the 2007 Pinot Gris Côteau Wellenstein. Charles Decker has a clear vision of his wines. He is one of the few who cultivates Muscat Ottonel grapes and experiments with German new varietals such as Siegerrebe, an aromatic grape. He specialises in sweet wines. Try his Muscat Ottonel wines but also the Chardonnay and the Pinot Gris are commendable. This is a very young undertaking, with the winery established only about 5 years ago. Before that the family produced grapes and sold the fruit to other wineries. The young vintner who studied oenology in Germany, manages the estate with his father. The classic varieties of Luxembourg are the wines you should try. Their Auxerrois, Pinot Blanc and Pinot Gris are ideal wines consumed with fine cuisine. It is worth visiting Luxembourg and its vineyards and wineries. Stop at any nice café or wine bar and try the local Elbling or go for the more elaborate cool climate Auxerrois, Pinot and Riesling wines. I found the following book very useful (in German): “Weine und Crémants aus Luxemburg”, Einkaufsführer 2009, Meininger Verlag (www.meininger.de), Neustadt, Weinstrasse. But also the Wikipedia write-up gives the newcomer a very good overview. This entry was posted on Wednesday, September 2nd, 2009 at 4:02 pm and is filed under wine regions. You can follow any responses to this entry through the RSS 2.0 feed. You can leave a response, or trackback from your own site. Visited the wine cellars yesterday. We had bought a combination ticket at the butterfly gardens. When we arrived at the wine cellard we were told that we had to wait 20 minutes for the next guided tour. No problem. 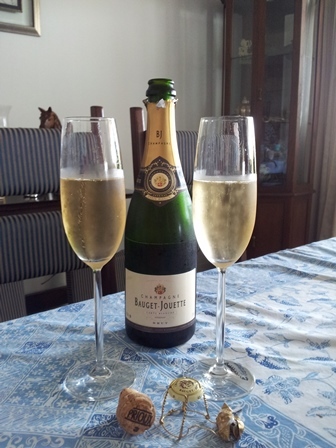 Since we also visited the wine cellars in 2011, we were asked if it was possible to have our glass of brut first. This was possible, We drank our glass downstairs, not in the official restaurant since we had a person in a wheelchair in our group and there was no/no elevator. Even for the disabled toilet you have to go up 1 staircase?! However, within 5 minutes after serving the wine we were told that the tour was starting since there were now 4 other Dutch people waiting as well. We all had to finish our wine in a hurry and unfortunately we had the same tourguide as last year. A man who shows as much enthousiasm about giving tours as a polar bear. We came to Bernard Massard to purchase wine. Especially their bubbles with peach is yammie. After making us feel soooo welcome, we will never ever purchase Bernard Massard again. Apparently their bussiness goes so well that they don’t have to be hospitable to visiters. Well done Bernard Massard in this time of economical recession! Finally, after many searches on the web for the towns of Mertert, Wasserbillig, Hamm/Saar, Filzen/Saar, Wasserliesch, and Igel—all homes of my great grandparents and their ancestors, did I find your blog. I’m passionate about genealogy and Moselwein, and your writing meets those needs very well. If there’s a link to do so, I will subscribe to your posts! Thus, the lawyer is the one who facts the media’s questions.